It is said, that in America’s younger years, many law schools taught contract law, using the Book of Romans, as the model of a perfect contract. Well, as we know, the secularists moved in years ago, and soon began removing anything Christian from this society’s public institutions. Now, as for the contracts of men, we know that the people of the world often put what is known as “loopholes” in t heir contracts. For instance, a good contract lawyer might slip in a clause which allows his client to slip out of the contract altogether, for this or that reason. But would God ever do such a thing? Would God ever put a loophole in His infallible Word? Well, let’s explore this Book of books to see if God did put any loopholes in this document. BIBLE, A BOOK OF LOOPHOLES! Actually, if you think about it, the Bible is a contract made up of one loophole after another! And so, right there, God made a divine contract to Adam, that should he or his wife eat of that forbidden tree, they would die! But then, when they did eat of that tree, they didn’t die did they? Does, this make God a liar? No, God is not a liar! Adam and Eve began to die in that day! Death entered their bodies on that very day. And though it took many centuries for death to finally put them into the grave, God’s warning proved true and trustworthy. But then, right there in the garden, God added another loophole to His contract with Mankind. Yes, right there in the garden, God added a loophole big enough for the proverbial Mac Truck to drive through! Because this little comment He made, was a way of escape from that death sentence hanging over the heads of all Mankind! A Savior was to come into the world! And that Savior would eventually destroy the serpent! LIFE AND DEATH: A SIMPLE CONCEPT! Now this devotional does not have time to explore all the many other loopholes in God’s contract with Humanity. But let’s just explore several other places in Scripture, in which God has placed loopholes big enough, for that same Mac Truck to drive through. So there we have it! The wages of sin is death. But the gift of God is life eternal! Very simple concept! Right? Now this clause in God’s contract is seemingly very ambiguous! Because, it almost seems as if God is saying that the entire Creation, which He refers to as “they” in verse 23, will be delivered into the glorious liberty of the children of God! So just what does that above passage mean!?! OK, so it says here that the unmerciful will be shown no mercy by God. Now that’s pretty plain! But then, the very next statement says… “and mercy rejoices against judgment.” So here again, God makes a seemingly clear-cut condemnation, but then says… “And mercy rejoices against judgment”. And so, once again, God is giving Himself plenty of wiggle-room in these two statements! But we don’t fully understand just what He means, when He says… “And mercy rejoices against Judgment”, although many think they know! And so, if we were smart, we would do well not to play the fool, and get so dogmatic about the Bible, especially concerning future events! Listen to Paul… “And if any man think that he knoweth any thing, he knoweth nothing yet as he ought to know.” 1st Corinthians 8:2. As this above verse reveals, we need to realize that knowledge, true knowledge, is the gift of God, and that God hates human pride. And God will make us as fools if we begin to get dogmatic about future events! Oh yes, we know in part, and we prophesy in part. But we need to quit making ourselves as if we are some sort of know-it-all authority concerning the details of the Judgment Day before us! After all, the Bible says… “For there is one God, and one mediator between God and men, the man Christ Jesus; Who gave himself a ransom for all, to be testified in due time.” 1st Timothy 2:5, 6. Now just why did God say… “To be testified in due time”? After all, we all know that Jesus paid for the sins of all Mankind. So why does it say that this truth will “be testified of in due time”? THINGS HARD TO BE UNDERSTOOD! The fact is, the whole Bible is filled with countless similar, puzzling statements! And only a fool would dare to say that he or she knows what Judgment Day will be like. Now of course, the Bible presents many clear-cut statements! For instance , God says… “I hate divorce!” Malachi 2:16. And there is no getting around that statement! And God says that He hates all sin! And so, there are many things which the Bible has made as clear as noonday. But when it comes to many other things, God says… “As also in all his epistles, speaking in them of these things; in which are some things hard to be understood, which they that are unlearned and unstable wrest, as they do also the other scriptures, unto their own destruction.” 2nd Peter 3:16. You see, God doesn’t reveal everything. He has withheld many things from us, for His own reasons. Listen… “The secret things belong unto the LORD our God: but those things which are revealed belong unto us and to our children for ever, that we may do all the words of this law.” Deuteronomy 29:29. Those who are wise take note of such passages as this, and consequently, temper their doctrines and teachings to include this and other similar passages. In other words, they refrain themselves from becoming too confident and too dogmatic about what the Bible actually teaches. therefore let thy words be few. This constellation was identified on May 22nd, 2014. 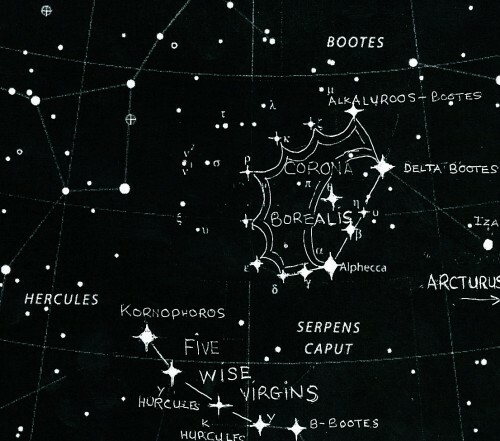 It is simply five stars, two from the Serpens Constellation, and stars from the Hercules Constellation.